Yesterday, Queen Elizabeth II of the United Kingdom celebrated her 91st birthday. 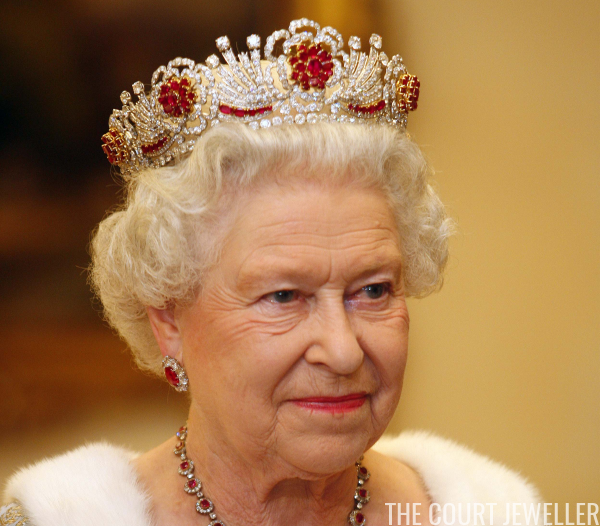 To mark the occasion, we're taking a closer look today at one of her personal contributions to the family's tiara arsenal: the Burmese Ruby Tiara. 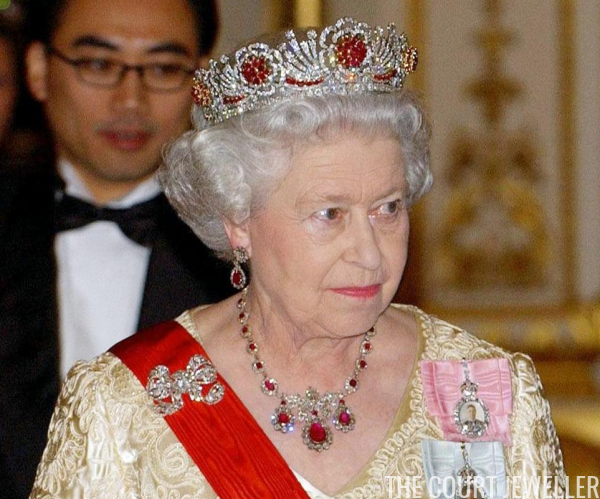 Aside from the Oriental Circlet, the Burmese Ruby is the only major ruby tiara worn by the current queen, and it’s a piece not without controversy among the tiara lovers of the world. Part of the reason that the piece is divisive can be traced to its construction. Like many other pieces, this tiara was created using stones from another tiara that had been dismantled. In this case, the sacrificial lamb was the Nizam of Hyderabad Tiara (pictured above), a diamond floral tiara that the queen received as a wedding gift. The Nizam was an Indian monarch, and, in my mind, he gave Elizabeth one of the best wedding gifts of all: he instructed Cartier to let the princess choose whatever she wanted from their collection from her gift. Kind of like the royal equivalent of a gift card to your favorite store today, I suppose? 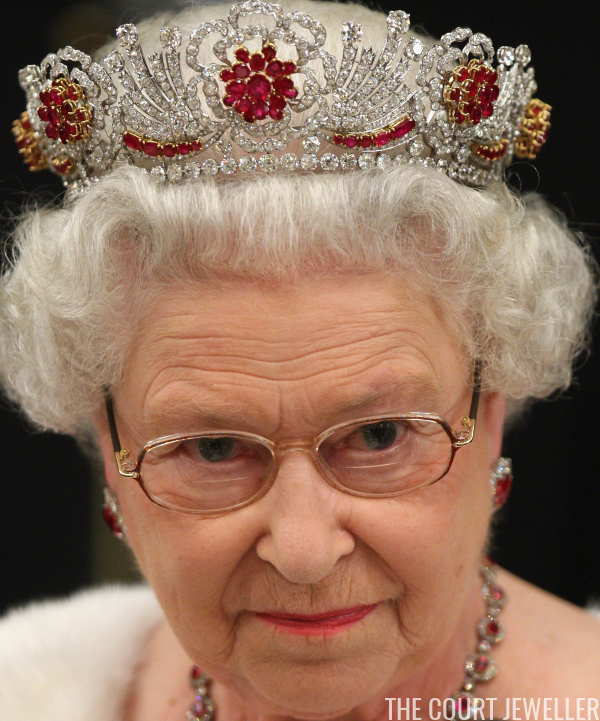 The reason that the Queen needed a new ruby tiara is a little unusual. 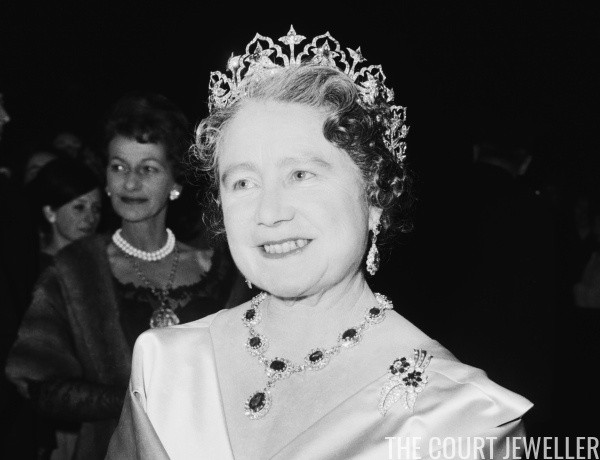 When she succeeded to the throne in 1953, she should have taken possession of all of the jewels designated as "heirlooms of the crown" by previous monarchs and their spouses. This collection includes the Oriental Circlet, which was made for Queen Victoria and then reset with rubies by Queen Alexandra. Anyway! The new ruby tiara was made by Garrard in 1973. The rubies used in the making of the new piece were also a wedding gift; Elizabeth received them from the people of Burma. The gift included precisely 96 rubies, all of which are now set in the tiara. The Burmese people believe that rubies help protect the wearer from the 96 diseases that can afflict the human body — they definitely wanted to ensure that Elizabeth remained hale and hearty. The rubies and diamonds were set in a series of rose motifs, and if you know your English history, you’ll recognize a heraldic rose that combines white and red petals as the Tudor rose. Ultimately, the tiara is much more modern than many of the pieces in the Windsor collection, and many seem to find it not precisely to their tiara tastes. It's been a few years since we've seen this one in public, but it was one of the Queen's favorites for years, so I wouldn't completely count out another appearance at an upcoming gala or state banquet.